Mohill Parish, consisting of a small town and a wider rural hinterland is situated in South Leitrim. The Parish Church is in Mohill town, but there are two outlying communities consisting of Eslin and Gorvagh, each with their own Church and Community centre. In the not too distant past the Parish was served by three priests - a Parish Priest and two Curates. It was also richly endowed by the local St. Ann's Convent of Mercy. With the decline in vocations, the parish is now served by a parish priest assisted by the retired former parish priest. The local Sisters of Mercy have also regrouped - having sold their old Convent, they now live as a community of four sisters in a private house in Shannagh Grove. Despite the changes, the Parish is upbeat. Roles filled in the past by the local clergy and religious are now assumed by enthusiastic lay people. The qualities of hospitality, care and concern live on in the capable hands of committed lay men and women. The parish boasts of an enterprising forward looking people. The people of the Parish are a proud people, keeping alive a rich heritage of family, social and religious values. 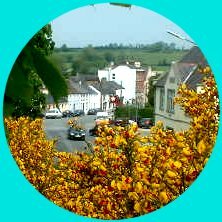 In a world consumed by commercialism and the needs of the individual, the people of Mohill retain deep spiritual values and concerns for the wider community. It is on these two values that our Parish thrives and goes forward. We are also conscious that many of our people move away from home - some within the country, but many overseas to other lands. The history of emigration has left its scar on the Parish community here too. Time and again, we have people visiting from overseas, wishing to re-establish links with past roots. The mobility of recent generations, coupled with a new self confidence, has lessened the pain of leaving home and parish. However, there will always be the need to touch base with the home scene, be it the joy of a marriage or the sadness of a bereavement, or simply to meet family and friends.